How broad a swath do these two discs cover? 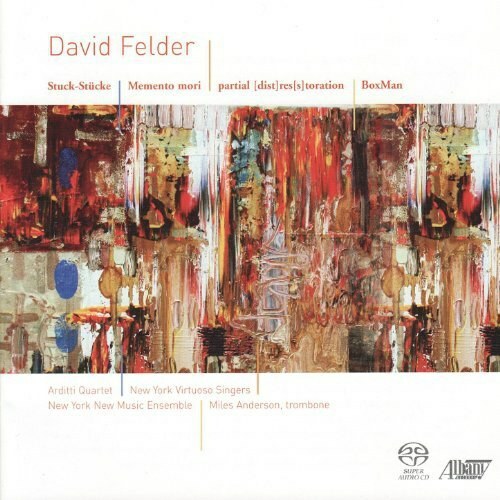 Certainly, even though all of this music except for BoxMan comes from the 21st century (and even BoxMan is heard with 21st-century revisions), the selection is broad enough to suggest both David Felder's undoctrinaire range and the jeremiad spirit that runs through his output. Still, of the two qualities, it's the variety that's most striking on first acquaintance. From the paradoxically intricate meditation of Shamayim (a video and music collaboration between Felder and filmmaker Elliot Caplan) and the underlying, if troubled, lyricism of Memento Mori (texts by Neruda, musical inspiration going back, in spots, to the Renaissance) to the wild outbursts of BoxMan (a solo trombonist interweaving with electronic transformations of himself), this is music that throws you consistently off balance. Even within a given piece, variety is often the most immediate quality. Stuck-stücke , for instance, consists of 13 often super-virtuosic fragments (two of them further sub-divided), most under a minute and a half - and while many of them draw on what we might loosely call post-Webernian vocabulary, and while many are united by what the composer calls "an incessant, repetitive iteration of small gestures," the sense of startling juxtaposition tends to trump the sense of continuity. The work shares little with Memento Mori. This choral piece works in longer and more patient arcs; in spots, especially toward the beginning, it has a certain superficial kinship to the new spiritualism of composers like Pärt. But even at its most restrained, it's far more eventful and far more apt to float into extreme dissonances. BoxMan has a different persona - impulsive and extroverted, it's a manic piece that calls on the soloist to do everything that the instrument is capable of, and much that you might have thought was beyond its capacity. Intended for a performer on stage and with speakers surrounding the audience, it's the kind of piece that demands SACD multichannel - Felder, in our discussion, suggested that it would sound "pretty squashed" if heard in two-channel stereo, and he's right. To get the full effect - which is dizzyingly spectacular - you need the right equipment. As for partial [dist]res[s]toration, it inhabits yet a different musical universe. An enormously rich and complex sextet ( Pierrot ensemble plus percussion), it seems to call for a kind of archeological listening, since it treats musical history - to quote Paul Griffiths's excellent notes - "as layered" in the present rather than "stretching behind us with the past irretrievably gone." Old sketches of Felder's own are rubbed up against newly composed music in a way that, as the composer points out, restores the former and distresses the latter; in the process, suggestions of older music by other composers are mixed in, too. Griffiths points to Carter, Schoenberg, and the Renaissance; I hear echoes of Messiaen; you'll no doubt hear other sources in this kaleidoscopic piece. The most extensive work here is Shamayim , which combines images of nature with voice and electronically manipulated vocal and nature sounds. A few issues back, Robert Carl gave a good description of its origins, structure, and tone, aptly describing the work as, at least in part, "a search for the sublime in nature, albeit a restrained one," but also pointing to its intellectual complexity (33:4). On the whole, I was more taken with the piece than Carl was - although that may be in part because he listened to the two-channel mix. For there are at least two reasons Shamayim , perhaps even more than BoxMan, demands multichannel playback. First, there's a visceral reason: The music opens out immeasurably in surround sound, creating, among other things, what Felder calls a "ceremonial space." In two channels, that space is flattened, and the music is reduced to a soundtrack for the images. Second, there's an intellectual reason: Physical space is one of Shamayim 's key structural elements. Granted, this is a complex work on many levels; for instance, the Hebrew letters around which the work is built have numerical equivalents that are played up in the structure of the work. But one of the key organizing factors is space; as Felder put it in his interview, "the physical shape of the various Hebrew letters that are connected to natural elements are carved through the space." Without that spatial dimension, much of the work's rigor is lost. I hope my stress of the music's rigor won't discourage any listeners. I don't want to minimize Shamayim 's intricacy - even Felder himself, in our discussion, wondered how much of its structure you can identify on a conscious level (although he does believe that something "structurally iterative and repeated" in a work may still register "on some subconscious level"). 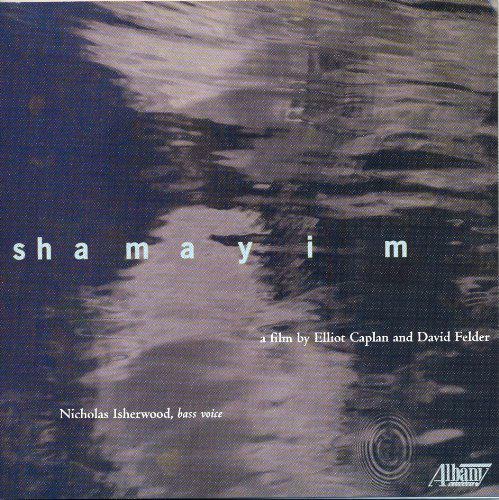 But despite its complexity, Shamayim has that visceral side as well - a gorgeously sensual immediacy that (especially as you're engulfed in the surround-sound tracks) arrests your attention. So even if you are unable to follow the music's formal ingenuity - indeed, even you're not entirely sympathetic to the specifics of its spiritual dimensions - you may well find that Shamayim works on you in a way that heightens the attention with which you perceive the world around you. You really can't talk about the "performance" of Shamayim . But the performances on the other disc are all expert - and even the more conventional works that don't disperse the sound sources around the hall benefit from the added presence of the SACD surround tracks. Warmly recommended.